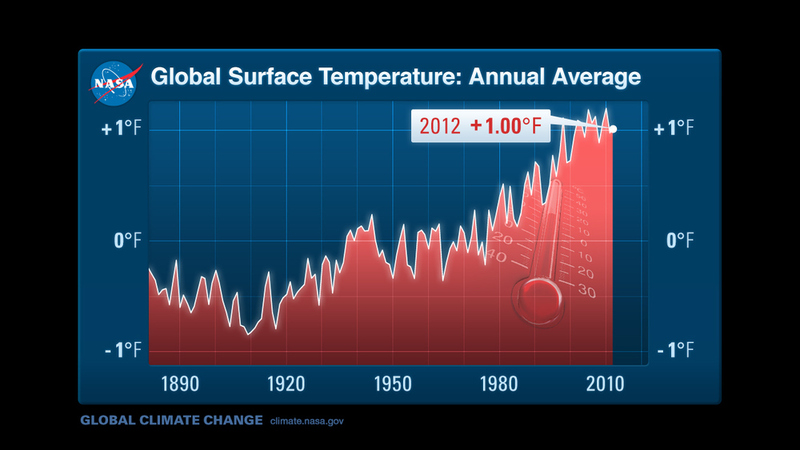 The global average surface temperature in 2011 was the ninth warmest since 1880. The finding sustains a trend that has seen the 21st century experience nine of the 10 warmest years in the modern meteorological record. NASA's Goddard Institute for Space Studies (GISS) in New York released an analysis of how temperatures around the globe in 2011 compared to the average global temperature from the mid-20th century. The comparison shows how Earth continues to experience higher temperatures than several decades ago. The average temperature around the globe in 2011 was 0.92 degrees F (0.51 C) higher than the mid-20th century baseline. This graphic shows the rise in the average surface temperature of the planet since 1880, when modern records began. Temperatures shown are yearly average numbers. The global average surface temperature in 2012 was the ninth warmest since 1880. Nine of the 10 warmest years in the modern meterological record have occurred since 1998. Higher temperatures are mainly the result of increased levels of heat-trapping greenhouse gases in the atmosphere, especially carbon dioxide which comes from human burning of fossil fuels like oil, coal and gas. Plotted here are temperature "anomalies", calculated relative to the base period 1951-1980, rather than absolute temperatures. The data come from NASA's Goddard Institute for Space Studies, but they agree closely with the data from the other three science institutions that compile temperature records every year. The reason to work with anomalies, rather than absolute temperature, is that absolute temperature varies markedly over short distances, while monthly or annual temperature anomalies are representative of a much larger region. You can also find this graphic in NASA Meteorologist Center, which contains broadcast-ready graphics and animations. Credit: NASA Goddard Institute for Space Studies. This graphic shows the rise in the average surface temperature of the planet since 1880, when modern records began. Temperatures shown are five-year average numbers. The global average surface temperature in 2012 was the ninth warmest since 1880. Nine of the 10 warmest years in the modern meterological record have occurred since 1998. Higher temperatures are mainly the result of increased levels of heat-trapping greenhouse gases in the atmosphere, especially carbon dioxide which comes from human burning of fossil fuels like oil, coal and gas.